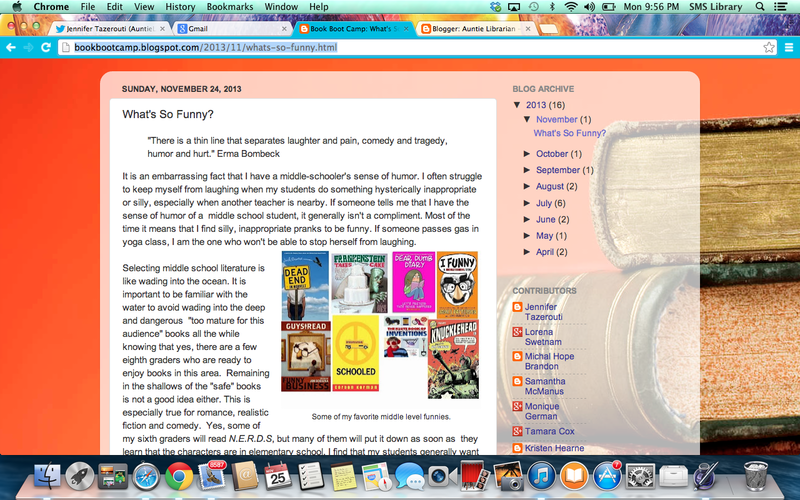 Here's a blog post I made on our #bookbootcamp blog about middle school humor. I am having a fantastic time learning with this excellent professional development opportunity. I find myself visiting the wiki and twitter hash tags when purchasing books. I can't believe all the titles I would be missing out on if I did not participate. It's working! 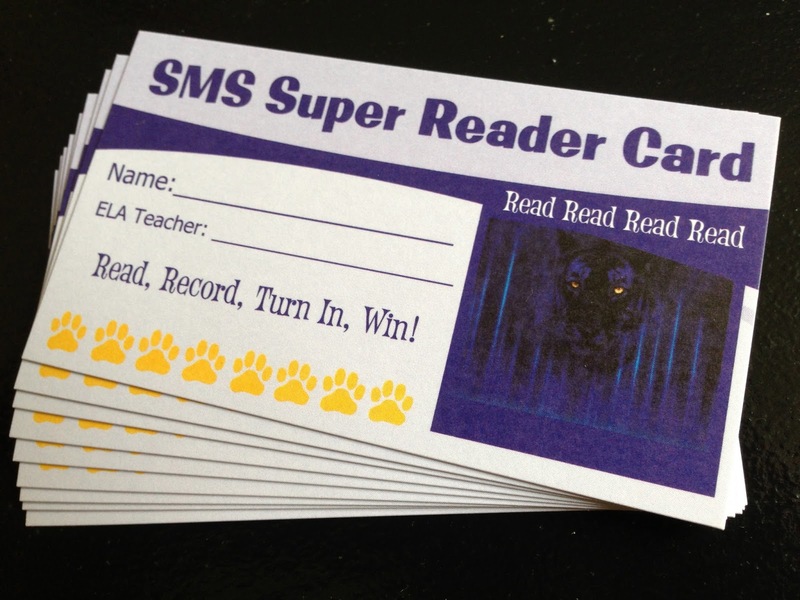 The Super Reader cards are starting to come in. Students are having conversations with their teachers and with me about the books they are reading. I am enjoying these conversations. There have only been a couple of students who needed to go back and re-read because they could not have a conversation about one of their books. After discussing the book in general and delving into deeper questions, it is quickly obvious if we have a faker. At that point in the conversation, usually the student is quick to fess up that they did not read or did not "finish" the book they were talking about. Because of the nature of these conversations it has not been awkward to have to tell a student to go back and read and try again. I usually ask them if they didn't finish the book and tell them to, "Go finish that book and come back to talk to me." The students took me by surprise and I had to put a rush order in for the level two cards. I did not think they would be ready for them so quickly. I think I like the level two cards even better than the level one cards. I love seeing all the writing on the cards that have been submitted, the combination of two or three people's writing, page counts and so on. It feels good to see something I made being used and enjoyed. This is definitely getting a better response than the reading log based programs I have done in the past. 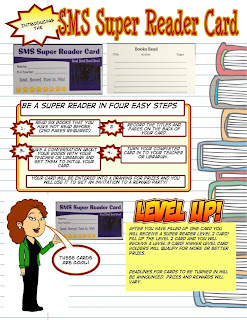 I am looking into doing a book fair sneak peak as our first reward for those who have already finished the first level. Here's what I think is making a difference aside from the cool factor of the cards. The program keeps moving, the students can turn in a level one card and move on to level two at anytime during the year. Rewards are scheduled, but also unannounced or random. For example, I am sending pencils, erasers and grippers to all the students who have already turned in a card. Anytime a student turns in a card they will get a "treat" sent to them in homeroom. They will also qualify for other rewards. The new Diary of a Wimpy Kid book coming out in November? What a great way to draw for a copy of the book or first check out rights! Book length. There was some debate over whether we should use 250 pages or 200 pages to count for a book. We decided on 200 pages and I think that is helping. Students have to read six books or a total of 1,200 pages. This is an obtainable goal. Portability. Many students carry their card in their plastic lanyard along with their school id. This is just the beginning. Hopefully we will see more success with this program as the year progresses. Testing in the Library? What's a Librarian to Do? The MAP Meltdown. It's three weeks into the school year. Orientation is done. Your new and improved reading program is launched, you're doing book talks on the morning news program. The books for book club just arrived and you are ready to start your lunchtime book club. Research projects are being planned and reservations are being made. The music is playing in your head and you are getting into the groove. It's going to be a great year. Everything's off to an awesome start, the ball is rolling and things are going so smoothly. And then, Uh-oh! It is suddenly time to have some MAP testing in the library for about two weeks. Proctoring, computer crashing, score reporting, makeup testing, that's what we're talking about here. Not quite what you were all excited about. Time flies when you are having fun, so MAP testing can sneak up on you and pop you in the head like little bunny foo foo. This could put a wrench in your excitement or cause you to have to up your anxiety meds. But are you going to let that happen? Are you feeling blue? Too bad! You've got work to do! Your lovelies are going to be visiting your library for testing. Let them check out books after they've finished their test. 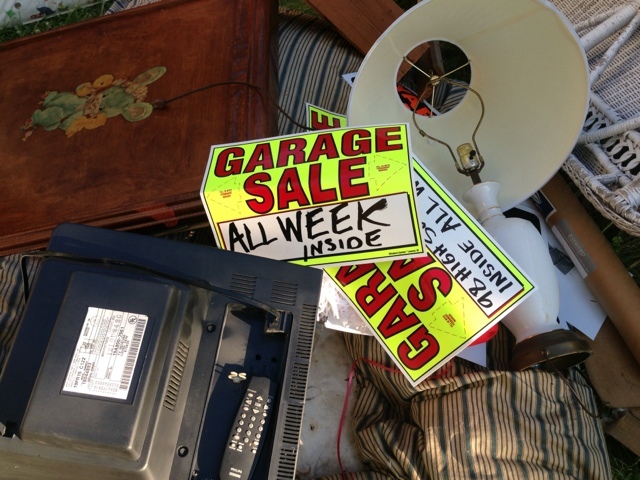 Make sure your displays are fresh and your promotional materials are ready for work. Push that new reading program and work off that donut! Teachers will be bringing their classes to take the test. What a great opportunity to collaboratively plan those research projects, show off new resources and build relationships with your faculty. Maximize that MAP testing time. Share that donut with the collaborating teacher! Your principal is so thankful that he/she can depend on you to make MAP testing go smoothly. Just know that even if it isn't said. It is good to be needed. Eat that donut, you deserve it. While the library is being used for testing and everything is running smoothly, try to get out of the library, if possible, and make some class visits to do book talks and activities, plug your new e-books and show everyone how to use them. Find opportunities to teach research skills and cyber safety. Consider asking the teachers whose classes will be in the library testing to check out books and confirm tests. Take a break when the test crashes. It is going to take NWEA a few minutes to get that server back up anyway. So, instead of stressing out and going mad trying to get all the students logged back into the test right away, stop for five minutes after you have recognized that MAP has crashed. You needed a break anyway right? Encourage teachers to have their students bring a book to their computer so they can read if the test should crash or if the students finish early. Usually MAP isn't down for long, so plan on being back on track soon. Before you know it, this round of MAP testing will be over, and you will be getting back in your groove. It's better for you and everyone else when you figure out how to manage the MAP meltdown instead of allowing it to shut down your program completely and give you the blues. Here are some things I am excited about this school year. 2. The Super Reader Card. Instead of a full page reading log, students will use a business card to record their titles. The reading program last year just did not bring in the participation I want. I think something like this will generate more interest and give the reading program a coolness factor. 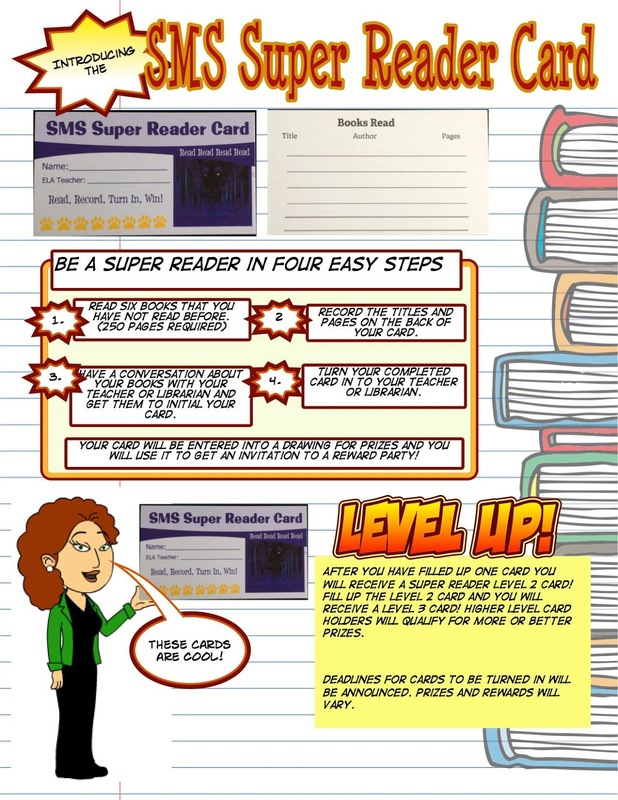 Plus, I am adding a level-up feature where students who fill up the first card get a new different looking level two card which get more rewards and privileges. Eventually, at the end of the year, our level four card holders will qualify to go on a special field trip to Barnes & Noble and the awesome Spartanburg Public Library where they will have activities waiting for us! I am thinking of more ways to use the card. One of our ELA teachers saw a classroom incentive card and thought the card concept would make a great idea for our reading program. Our students have lanyards and ID badges. Hopefully students will find that these cards will conveniently slip into their ID badge sleeves. 3. Divergent Book Club and Hunger Games Hype. I have plans for a Divergent Book Club for my 8th graders. Although it looks like the movie may be a bit more edgy than the Hunger Games was. I love using the movie trailers to fuel reading hype. 4. School Wide Read Aloud. We are reading The Running Dream as our school wide book. Last year we read Wonder and Schooled and had fantastic response from our students and teachers. 5. Technology Club. Last year we took a group of students to present an iMovie workshop at USC Upstate's Inaugural QEP Technology Symposium. The students got rave reviews and really enjoyed the experience. They were really excited that they were teaching university professors! USC has some amazing things going on taking technology integration to the next level. Many teachers are using social media to meet their students needs. It was awesome to be a part of this symposium. Hopefully we'll be taking our show on the road again this year. Someone once told me that students should be a part of all professional development for teachers. I have always believed in this and tried to involve students in the trainings and presentations I do at school whenever possible. After this experience I am even more convinced that students belong in the PD picture. Where technology is concerned, students are definitely an advantage. Here are some of the Tweets from our day at the QEP Symposium. Sims Muddle School students continue to impress us presenting http://t.co/NjQVmx1EAm during #qepup13 unconference. In addition to these five things I am also very excited that I have fixed the "broken" iPad lab which would not sync with Apple Configurator. After hours on the phone with Apple Tech Support I researched the problem and fixed it myself! AND - I successfully loaded that laminator with new film without jamming up the machine. The year is off to a great start at our school library. -Last year, I posted something to our SCASL list-serv about our Lyric Cafe. There were so many questions that I decided to make a blog post about it. Dale Anthony, the former Literacy Coach at our school showed me how to do Lyric Cafe. I have always enjoyed it. And, it has always been held in the library. Here's how it works. Lyric Cafe is a celebration of student writing. What better time to celebrate than the end of the year? After testing is over and you sometimes hear people say, "We took the test, the kids are done. I'm done. Why do we have school for so many days after testing?" we invite students to read at least one piece of their writing from the school year. Some choose poems, some choose short stories. Teachers read too. In order to participate students must agree to get up in front of their fellow students, use the microphone and read their work. Those that do not wish to read cannot attend. Four classes come at once, so students will be reading in front of people who are not in their classes. Scary! We (8th grade ELA teachers and I) do this with our eighth graders only. Some sixth and seventh grade ELA teachers hold their own lyric cafe event in their rooms. At one time, when our school was just grades seven and eight, we had two days of lyric cafe, one for each grade. We are now home to grades six, seven and eight. With the end of the year being so packed with events, it is almost impossible to find three free days after testing. We aim for a "coffee house" atmosphere and serve hot cocoa, cappuccino, danishes and cookies. We play music while the students are getting seated and getting their refreshments. It has been challenging to find places in the library that make the best staging area. This past year, however, we came to the conclusion that we didn't need a stage as much as we needed a decent backdrop. Our art teacher uses these black doors connected with hinges to display art in the hallways of our school. These made a perfect backdrop. We draped white twinkle lights over the top, bought balloons and got out the laser lights. Wow! The students loved it. We turn off the lights, cover the windows and doors and close the blinds. Students come up to the "stage" in groups of four. This is so they don't feel all alone "up there on stage." One of us always gives each group of students "directions" before they start reading. No laughing, no clapping, no negative comments. Instead of clapping, we snap. Cool, man! Cool. Last year was the first year we had Lyric Cafe without Dale. We weren't sure if we would be able to make it as nice as she always had. We even thought about not having it at all. But my colleague Ruth insisted on carrying on. I am very glad she did. Even though we have been doing this for years I am always surprised and impressed with what our students bring to read. What a great way to end the school year and send students that I have known since they were in sixth grade off to the high school. June, July and August. Gone. It feels as if I have lived a lifetime within those three months. It's been a full summer. I have eight thousand more miles of travel under my belt now, along with countless memories, wrinkles and gray hair. 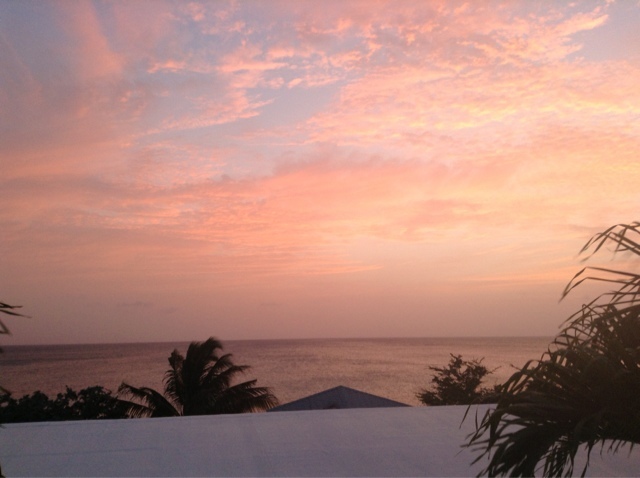 I've vacationed in Aruba, Bonaire and Curacao. My sisters and I sold my mother's ancestral home and its contents. We sold my mother's home. There's been a staggering amount of packing and unpacking this summer. We've packed and unpacked everything you can imagine: emotions, relationships, suitcases, boxes, cars, moving vans, furniture, dishes, clothes and ancient family artifacts. The summer has been beautiful and brutal. 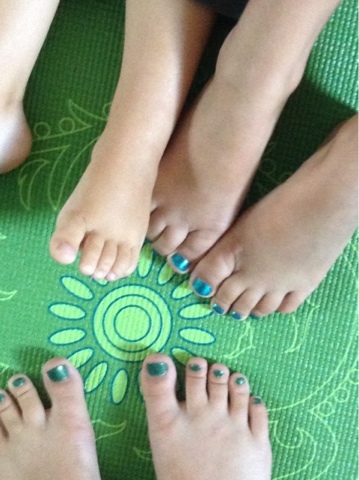 Soaking up my nieces and nephew was a wonderful part of my summer that helped me through the tough spots. We ordered room service, sang, laughed and giggled, watched movies, shopped, kayaked, ate ice cream, swam, had our nails done, participated in a fun run/walk, and watched fireworks together by the lake. Being with my sisters was great too. We did a spa day, I tried raw oysters for the first time, and we pulled up to the Ritz Carlton in Cleveland in a U-Haul. Since one of my sisters lives in Chicago I managed to squeeze in a day at the ALA convention where I met Alice Walker and Oliver Stone. The atmosphere there was electric. It was worth going even for only a day. It was worth going even if the only thing I did was listen to Alice Walker read to me. Alice Walker read to me. After Chicago, we headed South so I could open our school library for two days. This is the second year I have done this. We had more people come to the library this summer, but still no more than ten people took advantage of the summer hours. I heard about another librarian having "Summer Fun Days." I am definitely going to call my summer library days something like that instead of just saying the library will be open. Before I started my summer adventures I sent my principal and superintendent my annual report. This time I used Comic Life. I am not sure I would do this again. It may be too much visually. I may need to do more explaining. So, now that we're all unpacked and settled in, a new school year has begun. I think my experiences this summer have strengthened me. I feel ready to take on challenges with a positive attitude. Here's to a fresh new start and the promise of more adventures all packed neatly into the space of a school year. Dr. Keith Curry Lance presented a large amount of intriguing research that left me dazed and confused. I tried to take notes during the address, but it was all I could do to keep up with the fast pace of the analysis of numbers and statistics. I need to go through his slides later and really take time to look at the numbers again. I think I will need someone handy to help me make the best use of the information he presented. Like, maybe one of my SLIS professors. I left feeling that school librarians are proven to be important to student success, but that this particular librarian is no statistical wizard. 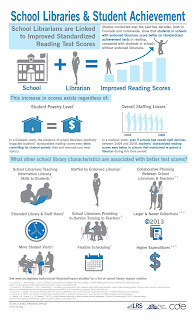 I truly appreciate that there is data that supports the presence of school librarians making an impact on student achievement. I need to harness that information. 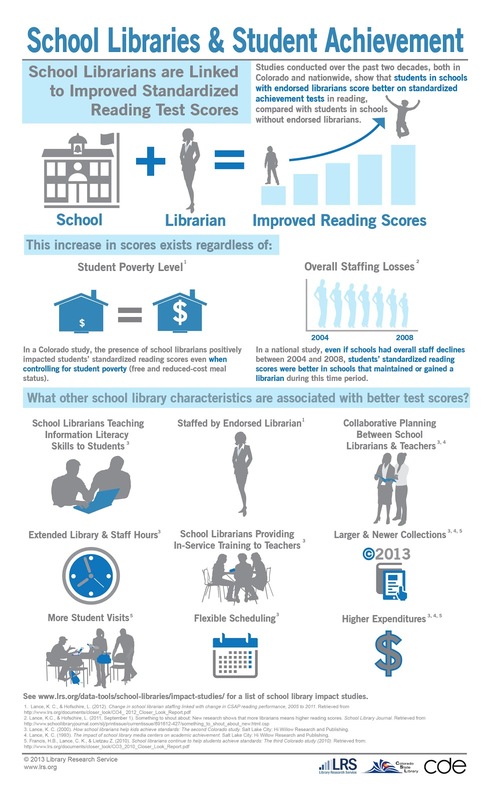 providing librarians with support staff positively impacts student achievement. Dr. Linda Karges-Bone's address just floored me. I felt important as a teacher librarian AND smarter after her address. Her address was titled "The Seven Signatures of Highly Successful Schools- Can you read the handwriting on the wall?" A career of educational consulting has led Dr. Karges-Bone to notice specific similarities and differences of highly performing / achieving school and struggling schools. As a PhD and researcher she is invited to two types of schools- successful schools or schools that are "going extinct", that are about to be taken over by the state department of education, failing schools etc. Basically, the schools she has worked with have been either highly successful or the extreme opposite. Over time, she has noted that successful schools shared some common practices. look at potential, (potential of students and teachers) in multiple ways not just one, and not just in the form of standardized tests. 1. Patience and proof guide instruction and assessment. Successful schools allow programs to settle in and do their work and give teachers time to find their rhythm. 2. Successful schools display positive messages that increase performance. These schools have a good feeling or tone which is not to be confused with loose trite "self esteem " efforts. Growth praise is important - give specific tactical praise. This specific type of praise is proven to impact the brain. Research proves that just telling someone good job shuts down the brain. The comment is ignored, dismissed. Specific praise, however, impacts the brain positively. There is more information on how to praise people effectively. 3. A powerful push to literacy exists in successful schools. 4. Highly successful schools have a pleasing, sensory rich environment for students to enjoy and learn in with displays of people's work throughout the campus. 5. Excellent schools are pushed by long range planning leading to change. Planning three years out not three months out. Data is considered from a long term aspect. 6. Successful schools are poised for the dynamic and are even defiant. They say no to practices and programs that do not support their mission and beliefs. 7. Highly Successful schools are piloted by teachers who are nurtured and free to pursue their passions. The children are not first, the adults are! Teachers cannot do their work or even good work if they do not feel comfortable, nurtured, and then they can put children first. Teachers are treated very well in highly successful schools, not overworked, not continually given more, more, more to do, their time is respected and they are paid for extra work. Mundane tasks are done for them so they can focus on the students. These schools invest in people not programs. Struggling schools are forgetting steps in the learning cycle. They are skipping motivation, apprehending and focus and going straight to acquisition, retention recall, generalization. Children who can't read on grade level by age nine probably never will be able to read on grade level. Those children have a higher incarceration rate. Some states use reading scores to predict the number of prison beds they need. All said and done, these two keynotes were fantastic as far as leaving me with much more than I came with, more tools to advocate with. My next post will feature the notable sessions I attended at SCASL '13.